Saturday, March 9 students, parents, and community members are invited to walk for and learn about mental health at the second annual Hope Walks Here walk. The two-mile Hope Walks Here walk will be held at Pearson Ranch Middle School, located at 8901 Pearson Ranch Rd. in Austin. Registration and a resource fair open at 9 a.m. with the walk set to begin at 10 a.m. Registration and participation are free. Participants may attend the resource fair, and at the conclusion of the walk, a presentation of Talk Saves Lives: An introduction to suicide prevention. Pre-register or register the day of the event. Registered participants who choose to fundraise in addition to walking will be awarded an event t-shirt when they achieve $100 in donations. 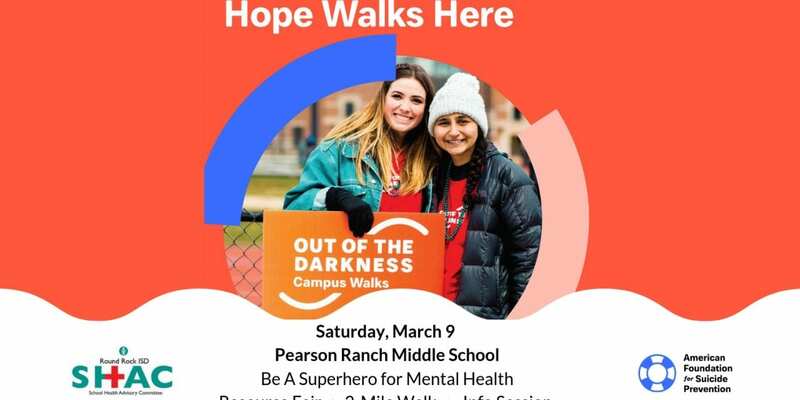 The theme for this year’s event is “Anyone can be a superhero… by speaking up about mental health each of us can be a superhero.” The Round Rock ISD School Health Advisory Council (SHAC) sponsors the walk. The SHAC is a group of volunteer parents and community members who serve as a committee for health-related issues for Round Rock ISD schools. Last year, the Hope Walks Here walk was started by the District’s Student Advisory Board. Members of the Student Advisory Board are students from each Round Rock ISD secondary school. Funds raised from last year’s walk provided mental health education to over 1,000 District staff, parents, and students. It is not required to participate in the walk to attend the resource fair or presentation.